04/01/17 – Confirmation that no C64 version ever existed. A very popular arcade from Atari in 1986, converted fairly well to the C64 by Elite around the same time. Mindscape were this time handling the sequel, which never existed as an arcade title. Paperboy 2 this time featured the chance of controlling a “Papergirl” too, and riding on both sides of the road at different perspectives. Slightly more ambitious and sadly moving too far away from the simplicity of the original. 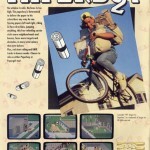 The game surfaced on all platforms, including the Spectrum and Amstrad, though as with Mindscape’s other game “Captain Planet”, Paperboy 2 was never seen on the Commodore 64. No review, no preview, just a blip on Commodore Format’s time scanner for about a month. It was advertised throughout issues for a while, but this sadly was it. No-one has ever seen how the game looks on the C64. Nick Bruty confirmed that Probe were only ever contracted to do the Spectrum and Amstrad versions of the game. This of course is really strange – as the C64 had the stronger market of the 3 machines. 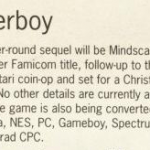 Did Mindscape have a special deal with an existing C64 developer to do Paperboy 2 and Captain Planet? Or did they just make a misguided decision not to do a C64 version at all for either game? We spoke to David Amor and Richard Leinfellner, who worked at the Mindscape UK headquarters at the time. They could not recall anything about a C64 conversion, though it is possible they could not find anyone who could do a conversion quickly. With the Spectrum/Amstrad version, Probe were able to knock something out very quickly. Possibly a coder was found, but maybe due to the game bombing on other platforms, they decided not to pursue the C64 version and quietly scrapped it. Mindscape certainly left the 8-bit platform well alone after both games. Sadly it means there is nothing to find of a conversion and could well be a case closed very soon!